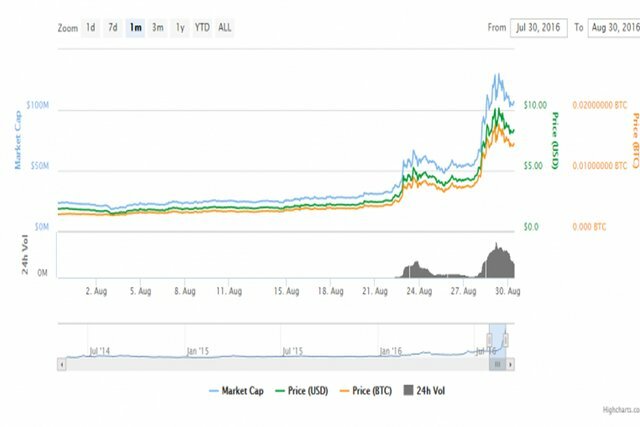 The value of the two-year-old untraceable cryptocurrency, Monero, has more than tripled in value in the past two weeks. Monero went from trading at a low of $2 to trading at a high of $8. The two-year-old Monero is widely recognized as an untraceable cryptocurrency, and online drug dealers have started to adopt it because it enables them to conduct business with complete anonymity. The price of Monero tripled in the past two weeks since the announcement of several darknet markets that will start accepting Monero as payment for various goods purchased. One of the most popular darknet markets, AlphaBay, know for its drugs such liquid LSD and various hybrids of cannabis, announced last week that it will partner with Oasis and begin accepting Monero as payment starting on September 1. This immediately led to increased media coverage of the announcement, attracting more speculators towards the cryptocurrency, Monero. AlpBay's announcement could have been the main factor behind the quick rise in the price of Monero, however, a report from RAND also mentions that illegal drug transactions on cryptomarkets have tripled since 2013, with revenues doubling, it couldn’t be far from being a major factor. Other factors that could have also contributed to the rise of Monero is the growing efforts by the E.U. to decriminalize Bitcoin use which could have shifted attention from Bitcoin to Monero. In addition, two weeks ago, a group of researchers announced the creation of an analysis software for US law enforcement that can be used to overcome the challenges of criminals using Bitcoin for transactions, but also to reduce the time and resources necessary to trace illegal commerce on the darknet. Monero was created in April 2014 as an open source project, and It's currently maintained by seven developers. Since it's creation in 2014, the team behind Monero have been focused on making Monero secure, private and completely untraceable, and they've managed to do just that. Monero is based on the CryptoNote protocol, which uses stealth addresses and ring signatures to conceal most transaction data such as the senders and recipients information, but also the payment amounts. The future of Monero is unclear, however, one thing is for sure, it's growing adoption among cryptocurrency users will surely draw the attention of governments and law enforcement agencies which may lead to substantial authoritative measures to monitor the use ​​of all cryptocurrencies. Monero certainly has been making headlines lately @doitvoluntarily. I presume that the anonymity factor is what's growing it's attention. I have been a big fan of Monero for the last year and used to mine it exclusively, but GPU mining Lyra2 and Neoscrypt are currently so much more profitable I had to adjust at some point. I feel like the boom on Monero is a bit unwarranted at this stage. I feel more people are adopting it as an alternative to Bitcoin due to the block size problems. My biggest concern with "untraceable" crypto is that, at least in this case, it is only untraceable if you REALLY know what your doing. Just using the wallet to send and receive is not enough. Ring signatures will ultimately be held just as accountable as Tor traffic, like when individuals get busted by correlation attack by the FBI. 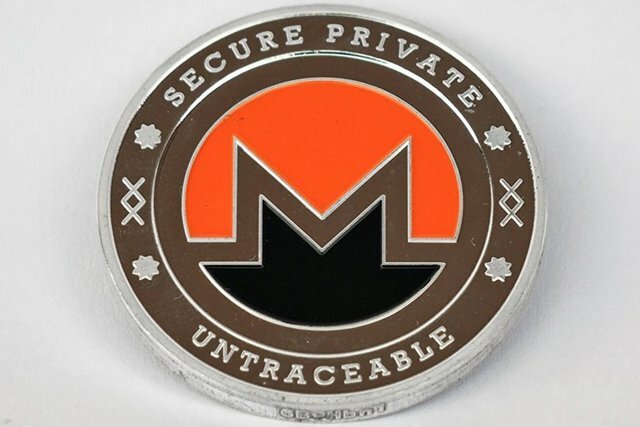 I find it alarming that so many people see "untraceable" and jump on the hype train, but Monero has been here, and will be around for a long time. ultimately I'm pleased with the growth, warranted or not. Clear that for some it been a good horse for enriching themselves recently. But what I think one should ask is what one is investing into ? With Monero , who knows ?? well that's sure some detailed info you gave me there. I don't pretend to understand the mining issues , that's a bit our of my depth really !! My problem with Monero is more the people that truly will use it and for what for !! i mean would you want to help develop and actively invest in something which aids say murder hits for mafia sorts or sexual slavery kingpins in the middle east. Its more this i was alluding to in my earlier comment !! If you ever come back, please let me know! This is crazy that I'm just seeing this. It's been right in front of my nose this whole time and I completely missed your comment. Then again, I haven't been on in quite sometime before a few days ago. I'm back...I think. Will try to write a post sometime today. Thanks for checking in with me 2 months ago and I'm very excited and happy for you on your Steemit success. Your positivity and generosity is what draws people to you. Positive vibes, attract positive vibes. Man, I just saw this! Glad to see that you can still get into your account! That could come in handy sometime! I'll try to keep an eye out for any posts you make! Be blessed! Yeah, I'm glad too that I was able to get back into my account. I kinda miss writing, just for the sake of writing. I remember now how it felt like writing posts back then. Will be posting something either tonight or tomorrow morning. Thanks again for the support @papa-pepper!